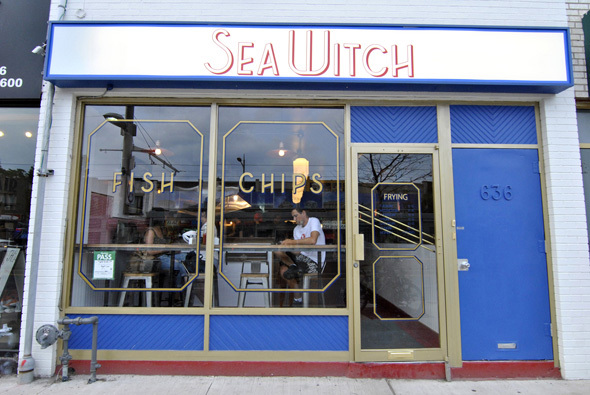 Sea Witch on St. Clair West is all about the fish. A rather simple menu consists of five types - haddock, pacific cod, halibut, pickerel and arctic char. Patrons can choose to have their fish in one or two piece portions with chips, on a sandwich, or on its own. 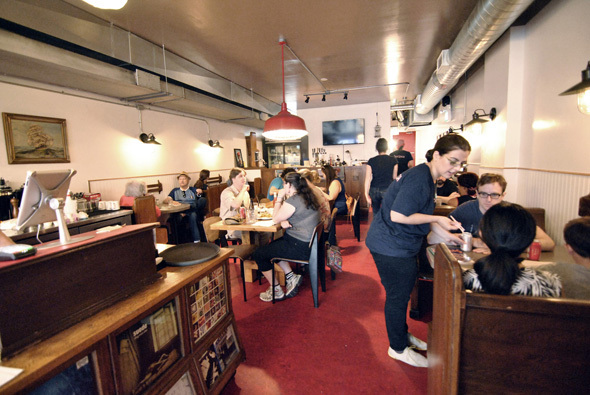 Aside from the mains, they also offer fish cakes, chowder and a halibut poutine. If you're looking for a vegetable that isn't a fried potato, or something slawed or pickled, you've come to the wrong place. Co-owner Kevin Kowalczyk mans the fish fry, having personally fried nearly every piece of fish since he and wife Jacki Strahl opened less than a month ago. 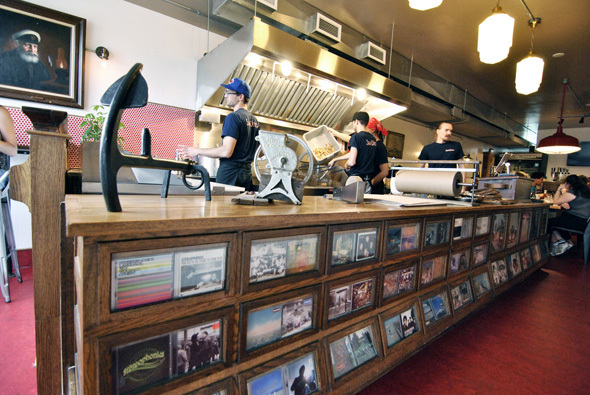 Both have been in the food industry for over 10 years each and are realizing a dream in opening this new venture in their own neighbourhood, on St. Clair West east of Christie. First out was the one-piece pacific cod and chips ($10). 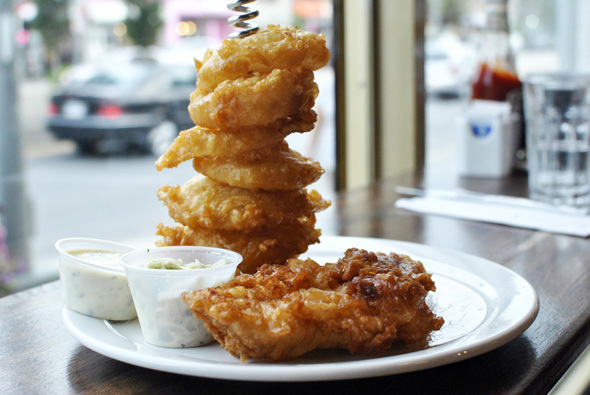 The large piece of fresh cod was perfectly cooked inside the crispy, golden, not-too-oily batter. The fish was served with a hefty portion of fresh cut chips, tartar sauce and a creamy coleslaw. A good portion size at only one piece, this was certainly enough to fill a big appetite. Next we tried the pickerel sandwich with fries ($14). The Lake Erie pickerel was prepared in the same way as it would be if ordered on its own, and served in a soft ciabatta-type bun. 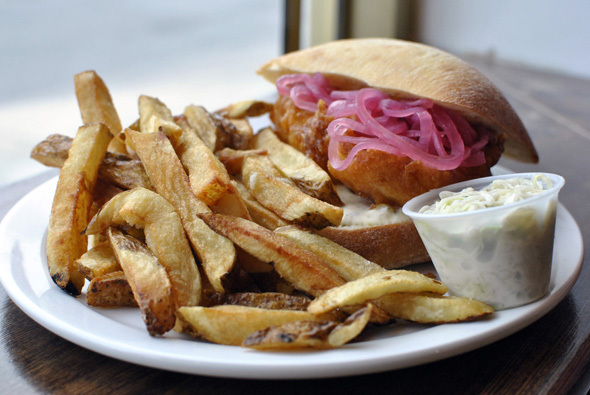 The sandwich featured another well-cooked piece of fish, topped with their house-made pickled onions and tartar sauce. While certainly a tasty sandwich, the bun felt like an unnecessary addition to an already heavy meal. We tried a sample of the halibut fish cakes which, like the chowder, onions, tartar sauce and coleslaw, were made in-house. 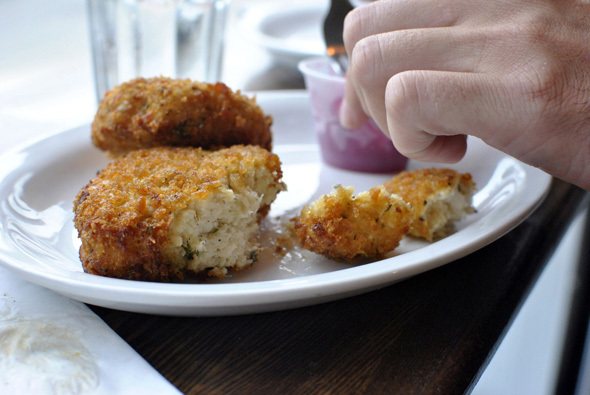 The fish cake patties were heavy on chopped fish, mixed with potato and parsley, and dusted in spiced panko; they'd appeal for those looking for something with a lighter fry. All in all Sea Witch stacks up well to the fish and chips heavyweights of Toronto and makes a great option for lunch or dinner. 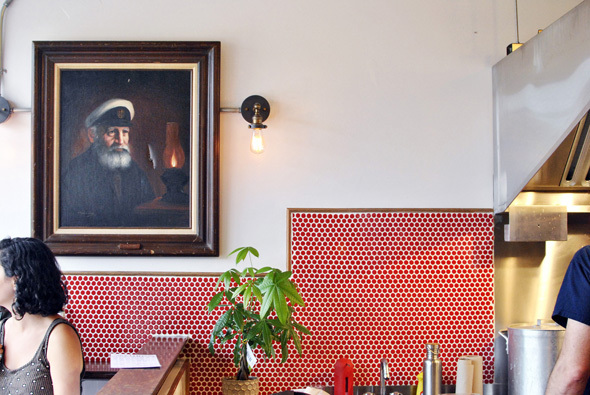 Despite being on the pricier side for fish and chips, I'd bet this new mom-and-pop will soon emerge as a neighbourhood staple. Sea Witch has seating for nearly 30 in the family friendly and liquor license-free establishment. Most of their traffic appears to be take-out. They're open 11am-8pm Tuesday and Wednesday, 11am-9pm Thursday through Saturday, and 12pm-7pm on Sunday (closed on Mondays).